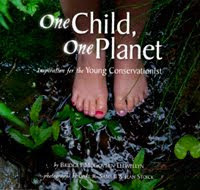 Since today is the day for the Green Books campaign, I thought it was an appropriate time to review another book that I recently received from my sister-in-law called ONE CHILD, ONE PLANET: INSPIRATION FOR THE YOUNG CONSERVATIONIST by Bridget McGovern Llewellyn. This beautiful picture book tells children (and parents alike) how very special our planet is and how we should take care of it. And in keeping with the overall conservation message of this book, the pages printed on recycled paper with vegetable-based inks. I have to admit that the very first thing that caught my eye about this book was the cover. I think it's just gorgeous and I love how the little girl's toes are painted in different colors of polish. And then when I opened the book, I was absolutely blown away by the photography. The pictures in this book are amazing -- one is more beautiful than the next! If you'd like to take a peak at some of the pages, you can click here. ONE CHILD, ONE PLANET not only has beautiful pictures but it also has catchy rhyming prose (although, I did have a few issues with the rhyming cadence, but that's probably just me!) I think this book will most appeal to children probably between the ages of 5 through 10. Younger children will enjoy the photos; however, the book and text is a little long for many to sit through. I also think the the greenhouse effect message might get lost on them. I especially think school age kids will appreciate this book; and teachers might like to use this book as part of their lessons on conservation. It's pretty evident that the author feels very strongly about protecting the earth and that she wants to share that message with the future inhabitants of our planet -- the children. Ms. Llewellyn is a mother of four girls, and she's very passionate about protecting the Earth. I think she's right to target the kids; and by writing ONE CHILD, ONE PLANET she is getting the parents attention, too. It's hard to argue with the messages in this book -- protection of the Earth, conservation, recycling, etc. When combined with pictures that show how gorgeous our planet is and how lucky we are to live here, I think ONE CHILD, ONE PLANET conveys a very effective message. I recommend it to parents and teachers alike who want to share the importance of protecting our Earth. Thanks to the author for providing a copy of this book. I think the cover is gorgeous too. Sometimes I wonder if schools are doing enough to teach kids about the environment since in our neighborhood, it seems like it's us old folks who recycle - those with kids at home don't seem to bother for the most part. Very beautiful cover, and (once again today, following along in BermudaOnion's commentary footsteps), I had a similar thought about kids and recycling and environmental education. Can't wait to see you Saturday at 4 (did you know that I am joining that panel?) You will do great! I agree with Kathy, it seems that those of us who were around during the first wave of recycling and composting and so on are more aware than the younger generations. This sounds like a super book. Off to see if my library has this one. Hi posters. Just wanted you to know that many schools are working to share this message. Cherry Creek Elementary in Lowell is so excited to welcome Bridget Llewellyn on April 20. She will share her message of conservation and help our school families as we become Earth Defenders during our annual One Book One School project. We are reading Just Grace Goes Green for March is Reading Month. Our lunch room co...mpost challenge begins on March 17 in our effort to be a greener school. Looking forward to Earth Day number 40!! !